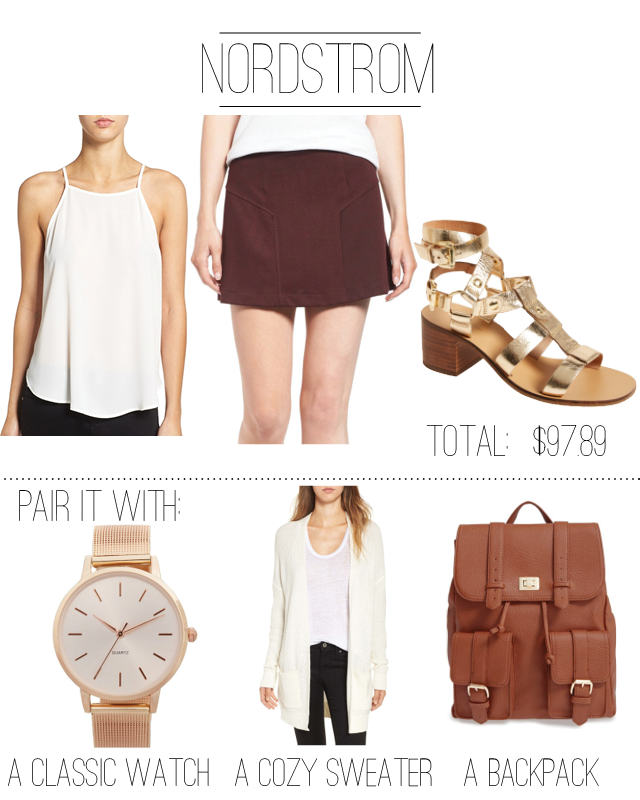 Back To School Looks: Under $100! 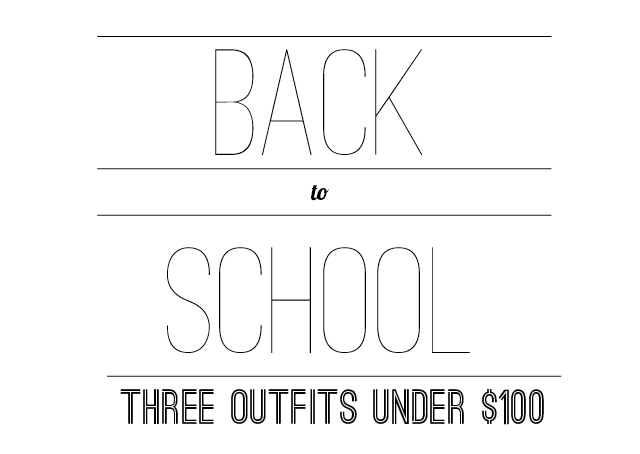 Magnolias and Sunlight: Back To School Looks: Under $100! I loved going back to school shopping! It was my favorite time of year because it was the perfect chance to update your look and add a few new things to your closet. Of course, I am not back-to-schooling anymore, but that doesn't mean I don't get the urge to do a little shopping every time August rolls around. I think fall is the most fun time for fashion and with all the September issues hitting the newsstands the inspiration is seemingly endless. I do know that it's usually too warm this time of year in most places to really showcase your fall picks, which means most of these looks are really transitional. So rock your mini with a sweater, your pants with a lightweight tee and keep your sandals out of storage as long as possible. And just a heads up the totals of these outfits are before taxes and shipping because that all depends on where you live! Not going back to school this year, like me? 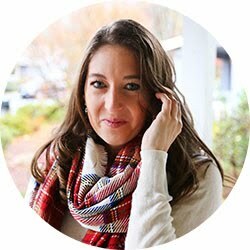 These outfits can all be worn to work or out with friends or on a date! You don't have to buy textbooks and school supplies anymore so you might as well treat yourself to a new, cute outfit! I love this burgundy color right now! It looks so great on so many people and pairs well with basically any neutral you already own. Going back to school is a great time to layer your pieces because you can walk to class in your tank without overheating, but then add a warm sweater for those freezing classrooms. I hated ruining a great outfit with a baggy sweatshirt just because they loved to blast the AC. So plan ahead and find casual cardigans that will look great and keep you comfortable. Adding color to your wardrobe is so fun, but I don't think many people think about adding colored pants to their closet. I own so many striped tops in neutral colors so pairing them with a burgundy pant is a great way to not look like I'm starring in a black and white film. Plus, this pair of pants is super flattering and hits right at the ankle so you can wear so many styles of shoes with it! Not feeling colored pants? Just switch them out for your favorite jeans for a similar look. This style of skirt is huge right now! I just got one that zips in the front from TopShop and I love it! I also love the look of balancing out a shorter skirt with a long sleeve top. This hunter green sweater is on my to-buy list once the temperatures start dropping because it's a great staple and only $18! 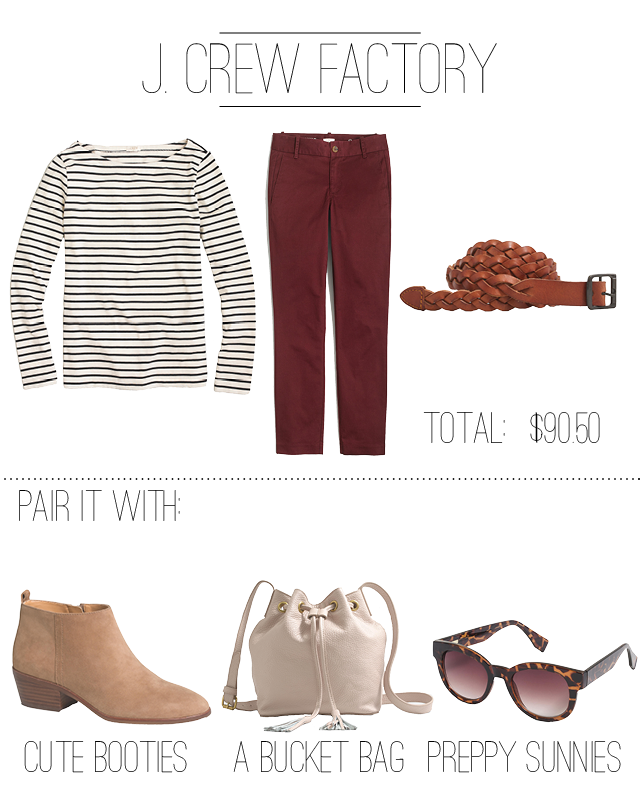 Pair it with a skirt and flats now or save it for skinny jeans, riding boots, and a blanket scarf later. It's the perfect piece to wear until spring! Where else do you love to shop for back-to-school? Love the striped shirt and the cozy sweater. So perfect for fall!